Photo Credit: Bryan Hall for avscannernews. LANCASTER – A man was found dead Monday at the scene of a commercial building fire in Lancaster, prompting an investigation by sheriff’s homicide detectives. 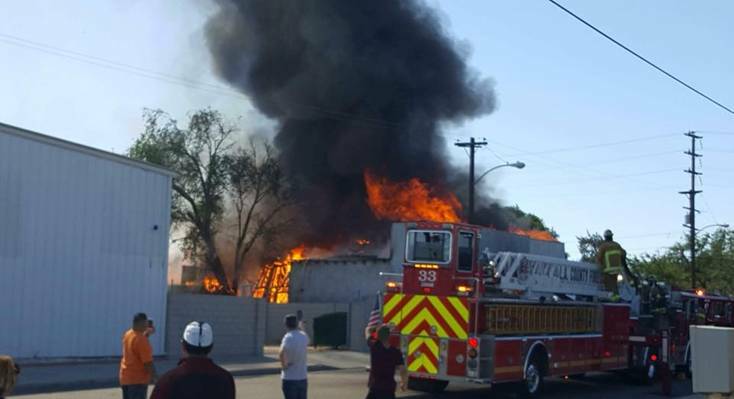 The fire was reported at 9:38 a.m. Monday, May 7, in the 45000 block of North Trevor Avenue, according to the Los Angeles County Fire Department. Firefighters encountered heavy smoke and fire at the one-story building and initially went into a defensive mode, fighting the blaze from outside the structure, a dispatcher said. Once they had gained the upper hand on the fire, they conducted search-and-rescue operations and found the victim, who was pronounced dead at the scene, according to the fire and sheriff’s departments. The fire was fully knocked down by 10:11 a.m., the fire department dispatcher said. The dead man’s name and age were not immediately available, according to Deputy Wally Bracks of the Sheriff’s Information Bureau. Detectives with the Sheriff’s Homicide Bureau are investigating the fatality, Bracks said. Editors note: We will update this story with more information as it becomes available. 7 comments for "Man pronounced dead at scene of Lancaster fire"
Today is: Tuesday, September 25th, 2018. Was murdered in the above very tragic fire. Darren, please rest in peace! Your family, friends and your community will find your killer or killers AND bring them to justice. Your loved so much by everone. I can’t imagine how anyone could have so much hate to murder you. What’s the name of the man that they found? Never mind, I get it now, sorry it took me a minute… But still, what’s the facts, and a reward for what??? Was it Danny Pimintel, or was it really Darren. And how do you know for sure, like what are the facts?